Today we’re going to be taking the topic of risk management to the next level. We are talking to Jim Gianoutsos with Regality Consulting. We are going to explore some of the challenges with a company’s approach to manufacturing processes as they apply to risk management. ● Information about Jim’s background and about Regality Consulting. ● Thoughts on how risk is sometimes a box to check rather than an integral part of every discussion and every decision that’s made throughout the manufacturing process. ● Why the adoption of ISO 14971 has been so problematic for medical device companies. ● Why it’s important to consider risk management before planning design. ● Considerations to keep in mind when outsourcing or getting components and materials from other organizations. ● Thoughts on validating processes and sampling based on risk assessment and management. ● An example that Jim has seen regarding a lack of sufficient risk management: the takeaway is to address risk management now; don’t wait until you get a warning letter. Jon Speer: Alright, you all know how, or probably know how I feel on the topic of ISO 14971 and risk management. And I'm excited to take that conversation of risk management to the next level on today's episode of the Global Medical Device Podcast. With me, I have Jim Gianoutsos with Regality Consulting, and we explore some of the challenges with a company's approach to risk management, on how to make sure that you're tying in manufacturing processes. So, you're gonna wanna listen to this one. Enjoy. 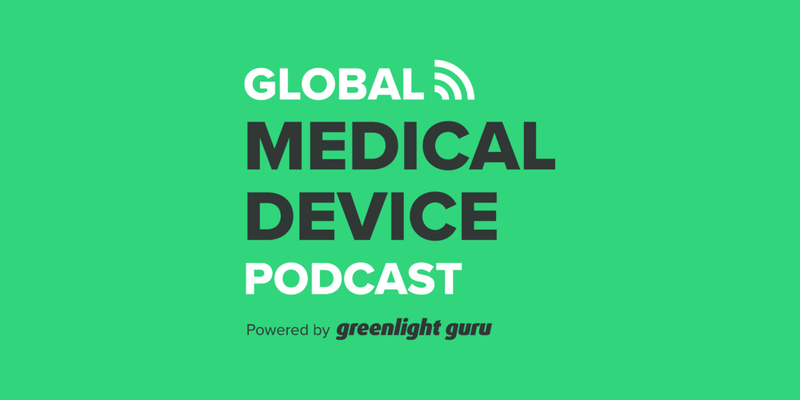 Jon Speer: Hello and welcome to the Global Medical Device Podcast, this is your host, the Founder and VP of Quality and Regulatory at greenlight.guru, Jon Speer, and I'm excited today. I've got my good friend, Jim Gianoutsos from Regality Consulting joining us on the conversation today, and we're gonna talk a little bit about risk management and its connection to manufacturing processes, and we're gonna get into some of the nuances. So Jim, welcome to the Global Medical Device Podcast. Jim Gianoutsos: Hey, Jon, thanks for having me, appreciate it. Jon Speer: Absolutely. Risk management is one of those topics I like talking about, and I'm gathering that you do as well. But I sensed, and we'll get into this here in a few moments that you've been dealing with some... Maybe frustration isn't the right word, but maybe some disconnects on the topic of manufacturing and production and process controls and how that relates to risk. So we'll dive into that in a moment, but could you do us all a favor and give us a little bit about your background and talk a little bit about what Regality Consulting does? Jim Gianoutsos: You're not the first person to say that, but... Yeah, so Regality Consulting. Basically, we focus on quality management system regulatory affairs for medical device companies. And for my personal experience and background, I've been involved with Class I, Class II and Class III PMA products, both from an FDA perspective and EU perspective, design dosier development, things of that nature. I've had the full gamut working for large world leaders of medical device manufacturers to very small boutique manufacturers, about 15-person strong. So I've seen the whole gamut in terms of why processes are the way they are, why they develop into these sometimes monstrosities that they are, into these bigger organizations and had that real nice perspective of the meeting in the middle and making sure that quality management systems work for your business. Jon Speer: Alright, well, that's a pretty good background. And folks, just so that... If you're looking of Gianoutsos and trying to figure out, "Well, how do I spell that?" Let me bail you out. It's G-I-A-N-O-U-T-S-O-S. And Jim's website, Jimmy G's website is regalityconsulting.com, R-E-G-A-L-I-T-YConsulting.com, all one word, no hyphens. So go there and you can learn a lot more about Jim's background. But Jim, let's dive into it a little bit. I've been dealing with risk for a long time, I know you have as well. And I think some of the challenges that I've seen is, well, risk is often used as a checkbox activity, it's done way too late often in the process. There's a misinterpretation or misunderstanding or misapplication, maybe, of the tools and the approaches and that sort of thing, and certainly manufacturing processes seemed to be forgotten when it comes to risk and I'm guessing that you've got some experiences on that as well. Jim Gianoutsos: No, yeah, I definitely do. I concur with... I think sometimes it's risky, sometimes an afterthought. People wait way too late in the process to actually do it. Obviously, with FDA and ISO and the new MDR, everything that's been coming out and the way that FDA and regulatory body's way of thinking is that risk is basically this cloud that the manufacturer needs to live in, and it has to be at the forefront of every discussion, every decision that's made on a risk-based decision. One of the biggest things I've seen, from a manufacturing perspective, is that if you have a solid foundation in risk, if your company's built on the ISO 14971, you develop products through the design development process, and incorporate those risk-based decisions and risk assessments in your products, everything else falls in line, and you have a real nice foundation to look back on to make the solid risk-based decisions that your company's gonna need from a in-process sampling, from an inspection sampling, from a validation standpoint, and through a final release perspective as well. It's fundamental, but I think a lot of people wait way too late in the game to actually do it. Jim Gianoutsos: Yeah, it's been a while. Jon Speer: Long enough for us to, as an industry, to have embraced that, especially knowing that this particular standard is, it's harmonized and there's not a lot of standards that are in that space where they've been basically accepted by all of the world's regulatory bodies and then the device industry. And so, what do you think it is? Why has the adoption of 14971, at least as a practice rather than a checkbox. Do you have any thoughts of why this has been so problematic or challenging for companies? Jim Gianoutsos: Yeah, I think, from what I've seen at least, it seems that you don't have the solid foundation. You didn't build it into your system to begin with. It was more of a, again, an afterthought. It's developing these decisions, and kind of going back, and almost developing the risks as you go along because you didn't put enough front-end development into actually determining, "Well, really, what are the issues that could present themselves either from a design development standpoint or a post-production standpoint?" Jon Speer: Yeah. I think that's a really good point. I do a lot of work with companies that are going through design and development, some that are certainly transitioning into manufacturing as well. And that's one of the things I try to hit on with companies that are in that process is, start risk early. You probably are even starting some of your risk management activities before you really get too in depth then from a design control standpoint. And, in fact, that might even be a suggested best practice from a design of your device standpoint, start risk sooner rather than later because doing so will actually improve your design and development. Jim Gianoutsos: Absolutely. Yeah, basically it'll set the stage for any type of incoming inspection, sampling, process validation, and final release testing as well. I think that people just make up some sampling plans based on right scientific rationale. But really, what is that scientific rationale? Well, if you actually go back to your risk and your risk assessment you've done for your product, then it's very clear that you've already identified what those risks are in that rationale and you can make a pretty concrete decision as to what type of sampling that you're gonna do from an incoming in-process, final release in-process validation standpoint. Jim Gianoutsos: It all goes back into that foundation. Jon Speer: Well, and let's talk about that 'cause as much as there's a challenge to jump in and address and try to implement best practices from a risk, from a design of a device standpoint, there's... We're even further behind as an industry, I think, as it relates to manufacturing processes. I think there's a huge disconnect that people don't think about design control also including the design of my manufacturing processes and they're certainly not making that connection from a risk standpoint as well. So, talk to me a little bit about what you've seen or the concerns or issues that you've dealt with in that space. Jim Gianoutsos: Yeah, sure, absolutely. Just recently I was at a client and there was some validation issues and they really didn't know how many pieces to sample from an incoming or OQ and PQ standpoint. So, really at the end of the day, if you develop a good sample size selection procedure and it's based on the risk of your device, and what I mean by that is, you can correlate the samples back to your risk levels that you assigned to specific hazards within your risk assessment. So, for example, sterile barrier breaches or things of that nature, that's gonna be high risk. Jim Gianoutsos: You're gonna have a higher sampling plan for that. Something that might be, not a non-issue, something that's easily detectable within the manufacturing process, you might be assigned a low risk, and then you're gonna have the lowest sampling size, whatever is defined in your sampling procedure. So, defining those hazards upfront, the severities, the occurrence, the overall risk level, any residual risk, things of that nature, really kinda set you up for, if done properly, an easy way to determine how much sampling you're gonna do. Jim Gianoutsos: And the outcome as well. So it's a really nice process if you can do it right. Jon Speer: Now, let me dive into that, 'cause I think what you've just said is really, really important to try to grasp and get a handle on. So, I go through and identify early on, and while I'm going through the design and development process, I identify risk, I determine the severity and the harm and the likelihood of that's going to happen, I take some action, I incorporate some features within my product to try to address and mitigate that. And so, if I'm gonna... Let me make the leap here. So now that I do that from a design output standpoint, that design output correlates to specific drawings and specifications, manufacturing instructions, manufacturing inspection procedures, those sorts of things. So, what you're suggesting, if I understood you correctly is that, depending on what my risk level is, that can drive what practices I put in place from a manufacturing process to try to reduce the likelihood of that harm from occurring. Jim Gianoutsos: Yeah, I think you hit the nail on the head, Jon. What it really comes down to, again, is about that risk-based decision making. So if you almost have that sequential process in place where it's design development, you develop your DMR, your bomb and all of that and include that in your manufacturing processes, then in turn you're automatically already integrating risk into your process. Jim Gianoutsos: So, I think that's a really important note that you just made. Jon Speer: Yeah and folks, this is why this is important because, especially... Well, it doesn't have to be just if you're outsourcing. But I know a lot of times you're buying stuff, parts, pieces, components from suppliers, vendors. You may be outsourcing different things to contract manufacturers and that sort of thing. These types of decision making processes will help determine, when you get components and materials from suppliers, this may help determine, "Okay, do you need to do 100% sampling of the things that you're receiving from your suppliers? Or can you implement some sort of sampling plan?" Of course, the key on that sampling plan, the caveat here, is make sure it's a statistically valid sampling plan. Don't just pick Jimmy G's plan or Jon Speer's plan, make sure that you can corroborate, there's a back-end to some sort of standard or accepted methodology. But it also may influence, as you get into the manufacturing process, whether or not you're doing some inspection, as far as while the work is in process during that "whipped phase" if you will, or if you need to do inspection activities at final inspection or maybe a combination of those things. So this concept of risk will really help drive and influence the design of your manufacturing processes. Jim Gianoutsos: Yeah, I think you're right on, Jon. And expanding on that a little bit, I think whenever you talk about setting up those specific sampling plans for your manufacturing process, once you validate a process based on your risk-based approach it's a very good rationale for either reducing your in-process inspection. So if you validate it to a higher scrutiny then you typically would anything else is based on the risk, then your in-process is a good rationale to decrease that to an S-level, if you're talking about ANSI standards, sampling standards, rather than general level inspections. So it's a really nice way to validate at one level but then, as you continue the processing and manufacturing, you can actually reduce that sampling based on a valid risk-based approach. Jon Speer: Yeah, that's a great insight. So Jim, I know that you've been in the trenches in these areas for a while, so maybe if you could, I'm putting you on the spot a little bit here, but if you could, share either [A] some best practices that you've seen, or maybe [B] some horror stories that you've seen to just help seal this point home a little bit more clearer for folks. Jim Gianoutsos: Yeah, sure. So right now, I'm actually at a client and they are under a warning letter for process validation. They have had significant issues in terms of not being validated or what validation they did have was not either correct or insufficient, and it all went back to the risk. And this was a fundamental issue through when the company started creating the products from a design development standpoint to the validation and then the post-market release. So really, I can't stress enough that you have to have valid statistical rationale for your sampling, for your validation, for your in-process testing, for your incoming and final release testing. Whatever it may be, it all goes back to the foundation of risk management, setting up a great process and then continuing to incorporate and integrate that process into your design development and manufacturing processes as you're continuing to sell this product. Jim Gianoutsos: They're your product. I think that for most companies, they don't see the issues until somebody else comes in and really nail them. Unfortunately for this client, that was a warning letter. So, now they're scrambling and this client has thousands of products and it's a very difficult situation. To nail that home, I can't stress enough how important it is. Jon Speer: Yeah, and I'll just add to that, 'cause I've worked in consulting engagements in similar types of scenarios where, when a company gets to that warning letter status, well, tension is high. Number one. Jon Speer: Stress is high. There's agitation, there's anxiety, there's frustration. There's all of these negative emotions associated with that. And the desire is to try to get out of that warning letter situation as quickly as possible. And so, at least in my experience, the way I've seen a lot of companies tackle that is, they throw a lot of Band-Aids at it. To say it another way, they're throwing a lot of paper at it and they didn't really address the problem. They just actually, they tried to appease the regulators so that they can move on to the next thing, and they didn't really learn their lesson. So folks, first and foremost, address this now. Don't wait until you get a warning letter. Nobody wants a warning letter ever. Be proactive. Get into your system. Evaluate. And this is a great way to potentially even be more preventive from maybe even a campus standpoint. If you haven't made this connection of your manufacturing process risk together and you haven't integrated these things together, this is something that is a growing expectation, not only from FDA but also in ISO world as well. So do something about it now. Don't wait till you get to that warning letter, 'cause that's not gonna be a fun time to deal with it. Jon Speer: Sure isn't. Jim, any other parting thoughts, words of wisdom that you'd like to share with our audience before we wrap up today's session? Jim Gianoutsos: Again, I think you brought it home. And almost don't wait until you get that warning letter. A lot of businesses, again, some businesses treat this as an afterthought. Great businesses treat this as a forethought. I think once it starts potentially affecting sales, then it becomes a high priority obviously, so just don't wait till that point and be proactive with it, especially with all the new regulations coming through from an international standpoint, and obviously the way the FDA has been thinking and the future of its thinking, the agency's thinking, this isn't going away any time soon. Jim Gianoutsos: And I just think they're gonna be more proactive in ensuring that you have the right process in place to make risk-based decisions. Jon Speer: Without a doubt. Folks, this is not going away. This is something that's here to stay and it's time to start to reevaluate your approach and make sure you have best practices in place. And if you have any question or concern, or wonder if in fact there's something that you can do about it and want to ask a friendly face with a lot of experience, I would highly recommend that you contact Jim Gianoutsos with Regality Consulting. Again, you can go to regalityconsulting.com and you can submit your contact information, all that sort of thing, and Jim would be happy to have a conversation with you about that. Also on the topic of being a friendly face that can help you optimize your systems and address your risk management scenarios, it's something that we do pretty well here at greenlight.guru as well. Jon Speer: So I would encourage you to take a peek at what we're doing, go to greenlight.guru and you can learn a lot more about our product platform, and specifically some of the workflows and the systems that we built into our cloud-based award winning software when it comes to complying with ISO 14971 risk management. So go there and check that out, and if you want to learn more about the product, you can request a demo and we'd be happy to have a conversation with you as well. Again, I wanna thank my guest, Jim Gianoutsos with Regality Consulting. And we've had a great time chatting today about the connection between manufacturing processes and risk management. 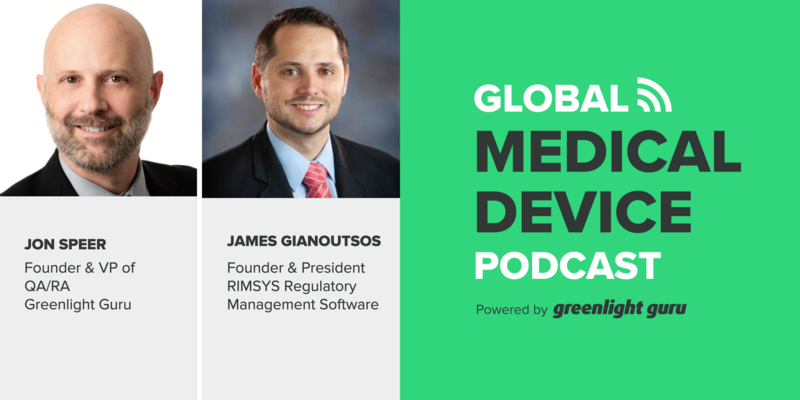 And this has been your host, the founder and VP of Quality and Regulatory at greenlight.guru, Jon Speer, and you have been listening to the Global Medical Device Podcast.